The mysterious Mother Nature has once again visited the Gulf Coast with a massive Category 4 hurricane benignly named Harvey which will leave the coastal areas in Texas where I grew up with devastating losses of property and lives. The best preparations, precautions, evacuations – no matter what the plans put in action to avoid catastrophes are, we struggle to survive the floods and winds that hurricanes bring. Mother Nature can be relentless. She can also be a goddess of good weather in one location while she strikes another one with terror. Fickle? clearly. Today on this Sunday, the last one in August of 2017, I woke and went outside with Spike and Charly to inspect the weather. What I saw was the unmistakable beginning of autumn as the leaves from our trees began to fall in the swimming pool. 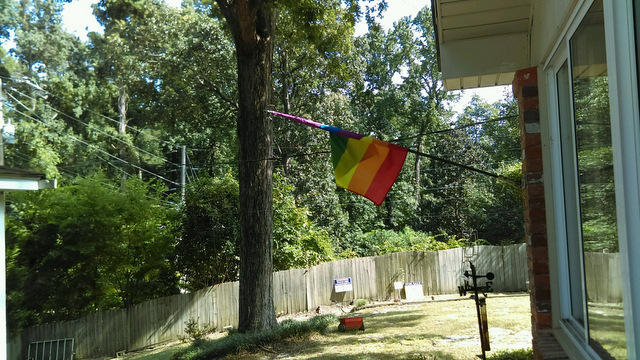 What I felt was a slight, very slight, shift toward a lower temperature in the air around me as a whisper of a south wind blew our Pride flag in a knot on the flag pole. Pretty and Charly took advantage of the gorgeous day to spend a few hours outside as the days dwindle down to a precious few for pool time. Hurricane Harvey will ultimately dissipate as all hurricanes do, but Mother Nature’s cruelty will linger for months or possibly years on the Gulf Coast of Texas as the waters recede and the people rebuild, but the sun will shine just as bright as it did on Cardinal Drive today…the stars at night will be big and bright deep in the heart of Texas. May that day come quickly. 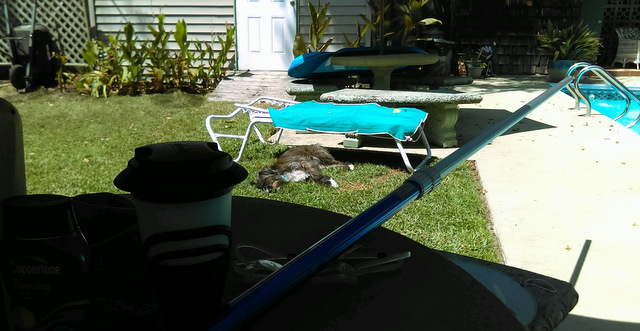 This entry was posted in Lesbian Literary, Life, Personal, Reflections, Slice of Life, The Way Life Is and tagged hurricane harvey. Bookmark the permalink. Sheila your prayers for your Texas family are appreciated. So far we are all safe and blessed and thankful. Enjoy the beautiful day you have for us… They are saying now Harvey will be hanging aroynd through Wednesday. Anne sends her love too! I texted with Nita today and asked her about you and your family and Anne, too. I too went out and enjoyed the beautiful weather today. I am sure ready for the heat and humidity to be gone! I’m praying for your Texas family and friends, including the fabulous Huss brothers, members of my riding friend Rosemary’s family who have been evacuated from their Houston homes (in army trucks!!) and all the poor animals caught in the tempest. Here in Pennsylvania, the weather is glorious. Not a sign of Nature’s wrath. The end of summer makes me sad. I’ll hang on your prediction of sunshine’s return knowing the aftermath of a hurricane often brings out the best in people. Enjoy the sights and sounds of late summer in South Carolina. Much love!! Thank you, my dear Pennsylvania friend. I am so glad you had a glorious day today, too. I’m so sorry we didn’t get a chance to visit this summer – Pretty calls it the summer of Canterbury – I’m sure you have other names just as fitting. Please give Pops, Cassie P, the Doctor and Miss Frankie our love from Cardinal Drive tonight – extra kisses for all – including you! I Love IT!! The Summer of Robbing Peter to Pay Paul!!!! We had that same summer with our Summer of Canterbury, too…as a matter of fact, we are still running from Peter!! Horrible Harvey! The images are shocking. Thinking of all the people displaced and hoping the weather predictions are wrong. Me too, Susanne…it’s a monster.